Father, where have you been? I missed you. . . Missed you guys, I shall tag you more often! You is your father! All your family is your father! AMissingLinguist and Miyuu like this. I eagerly expect more dad jokes on this site now. SayMrrp, AMissingLinguist, Nom de Plume and 1 other person like this. How does it feel to get tagged by me ever so often? I your Father thinks that @I your Father is quite good at saying the words' I your Father' at people who like saying 'I your Father' who are most likely people who hate @I your Father, I believe they are people who don't deserve to be called 'I your Father'. AMissingLinguist, Llamia, Ophious and 4 others like this. Falhrus and Casul Reader like this. Oh... okay. I guess you are the favorite child in the family? How rare. Your name reminds me of Douluo Dalu. 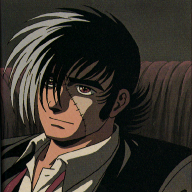 Edit: Once upon a time I liked Black Jack. Ah! The good old days. SayMrrp and Casul Reader like this. *Blushes Slightly* Keep in mind that writers are dull blades that are sharpened through writing! Falhrus and CloudySkySadMoon like this. CarefreeRainCloud and LazyDoc like this. will teach you how to put on makeup. Professor Charles Francis Xavier, CloudySkySadMoon, Chiaroscuro and 4 others like this. Llamia and CloudySkySadMoon like this. SayMrrp and Prometheus like this. welcome papa....may you enjoy your stay!! J-Mitch, Azuka and Risus like this. Nefasdetestasti, Reginald Twistleton, Risus and 1 other person like this. @Satan You add an agreeable sense of macabre to any delirium. so... you are the one who fucked my mommy? Albedos_Ahoge, Reginald Twistleton, Nefasdetestasti and 1 other person like this. Welcome to NUF.Enjoy your stay. "As the saying goes, life was given by the heavens, however, the path one takes is set by oneself. People that live in the heavens, can walk the life of a devil, while people that live hell, can live in the extravagance of the heavens as well. One’s decision has always been in one’s hands, the so-called ‘forced to do so’, is just an excuse to fall into despair."